US authorities are using trademark law to go after a California biker club, claiming the ‘Mongols’ use their logo to threaten and intimidate. The bikers say their colors aren’t a corporate trademark, but a club symbol protected by free speech laws. 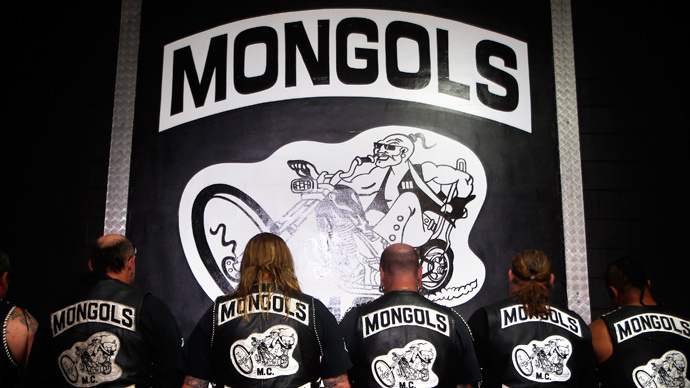 The “Mongols” started in California as a group of primarily Hispanic bikers, but has since grown to more than sixty chapters around the world, including branches in Sweden and Germany, federal prosecutors say. The government is going after the group on racketeering charges. A six-state federal sting in 2008, called “Operation Black Rain,” resulted in 80 Mongols members pleading guilty to various federal criminal charges. According to the Wall Street Journal (WSJ), the government is expected to argue the club remains “steeped in violence and criminal activity” and displaying Mongols insignia amounts to making a threat. Joseph Yanny, the attorney representing the Mongols, is optimistic about the chances of a fair hearing, after Judge Otis Wright II excused himself from the case last week. The group’s attorneys requested Judge Wright withdraw because he was the one to suggest going after the group’s trademarks in the first place. Yanny said the members involved in the 2008 indictment were no longer members of the club, and that the government was seeking to punish more than 700 members of the organization based on the actions of a few. The case has attracted national attention, as bikers across the US are concerned it might set a precedent and allow the government to go after them next. However, lawyers for the club have won preliminary court rulings in the intervening years arguing the club itself hadn’t been charged with any crimes. The Mongols are arguing their logo is not a business trademark, but a “collective membership mark,” which is considered protected speech under the First Amendment. The trial was originally scheduled to begin on June 2. The case has been reassigned to Judge John A. Kronstadt, and a new hearing is scheduled for June 4 in federal court in Los Angeles.